Bossier offers many different places to have fun with friends, enjoy time with the family and even a great place to work. Baylee Taravella is a young Bossier-native who enjoys traveling and spending time with her friends and family. It makes sense that Baylee would love her job as a salesman at Johnson’s Furniture where she uses her outgoing nature to interact with customers daily making their dream homes come true. 1. What made you want to work at Johnson’s Furniture? Whenever I interviewed for Johnson’s Furniture, I was 19 and had no idea what I was doing with my life. One of my friends got me the interview and it was a spur of the moment type deal. At first, I was very hesitant about it, but it was hands down the best thing that could’ve happened to me! Whenever I came to interview everyone was so inviting and friendly. The place had a great atmosphere. 2. Why do you love working in Bossier? I love working in Bossier because it’s a city with a small-town people. We get to meet people from all walks of life because we are located next to Barksdale Air Force base at the foot of the Shreveport-Barksdale bridge. It’s super convenient to get around town, whether I am going to North Bossier or South Bossier. 3. What does Johnson’s Furniture do for its employees that makes you feel appreciated? Johnson’s is very appreciative of their staff and they show it in many ways. We have meetings every morning and they’re really uplifting and motivational to help us get through our day. Our managers Toby and Zach are awesome; they treat us to breakfast and lunch regularly. They have created a positive atmosphere for us and the customers where we all work together. 4. Describe a time where you really made a difference for a customer at your job. I may not always remember the furniture sold, but I do remember personal connections with my customers. My favorite memory was demonstrating to an elderly gentleman how to Facetime his wife whom was in the hospital, so they were able to pick out new furniture for their new assisted living home. Remembering how happy she was to be able to see what we were looking at and picking out the furniture reminded me that it’s not all about the sale, it is also about the experience as well. 5. What are some career goals you’ve already met or want to meet while you’re employed with Johnson’s Furniture? Working at Johnson’s has allowed me to gain team work experience, improve communication skills, and helps me enhance my leadership ability. A career goal I have met already would be I am a top sales producer. My next goal is to obtain a million-dollar sale in a year, which I am on pace to meet! 6. What do you want the community to know about working for Johnson’s Furniture? I would want the community to know that it is such a pleasure and honor to work for Johnson’s Furniture. It is a family owned company that cares for their employees and makes sure they’re taken care of at all costs. I am very thankful for the opportunity to work here and would not change it for the world. Want to read about more folks that are lovin’ their job in Bossier? 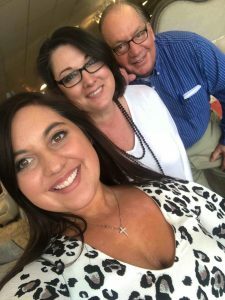 Check out last month’s blog on Holly Moerer at Cosse & Silmon Orthodontics.